Bring extensive reporting functionality to your application - with just a few mouse clicks. Detailed documentation, numerous samples and world class technical support are also included. 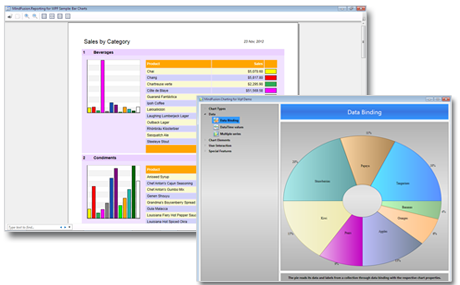 The reporting component supports all .NET data sources and is compatible with ADO.NET. You can work in both bound and unbound mode and are not restricted to the number of data sources that are used in a single report. Each report consists of pages and each page can have a header and a footer that are template-based. You can also customize the layout and appearance of each page and of each report item. The report can have as many report items as you wish. You can customize completely the report so that it suits best your needs. You can add charts for better presentation of the report data. Each chart supports unlimited number of legends, rich choice of brushes, themes and many more. You can add pictures and any WPF control. The component also provides a report designer tool, which makes styling and building the report a straight and easy process. 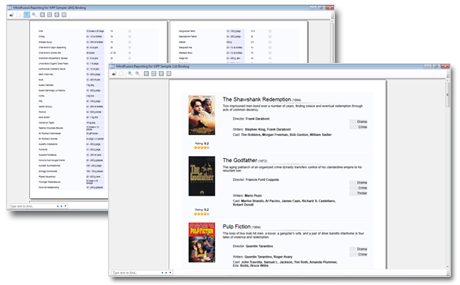 MindFusion.Reporting for WPF supports various output options. You can use a WPF Report Viewer tool for rendering the report at the screen. The viewer lets you zoom report pages, change the layout and navigate easily between the pages. Another option is to render the reports as WPF FixedDocument objects. Printing and print preview are also supported. The component lets you export your final reports into a variety of formats. You can export the report as an HTML page or as an XLSX file with the ExcelExporter. Export to PDF files is also supported - you just need to call a single method on the PDFExporter class.